It's okay to envy Ramsey Russell. You're human. You might even wish you could work for him for a few months. No pay, of course. You see, he's shot ducks you've never even heard of, hunted places you can't find on a map and already been everywhere you want to go. Argentina? "All the time." Mexico? "I've hunted from the Caribbean to the Pacific." Uruguay? "Repeatedly." Russia? Yep. New Zealand? Netherlands? South Africa? All over Canada and most of the U.S.? Check, check, check and check. No wonder his motto is, "It's duck season somewhere." Russell, owner of getducks.com, isn't bragging...well, maybe a little. He just really loves his job. You probably won't find a more humble and genuine guy in all your duck hunting travels. He would give you the last shell in his pocket and let you claim the triple you didn't really killâ€”unless they're banded, of course. You'd be that generous, too, if you hunted 222 days in a recent 13-month span. But life wasn't always so good for Ramsey. Just two weeks before his 16th birthday, he was cleaning paint brushes in the storage room of his boyhood home in Mississippi when the water heater ignited the fumes. The blast blew out a wall and the heat melted a fishing rod in the next room. The searing flames sent Russell to a burn unit in Texas where he spent six months undergoing an endless string of surgeries and physical and mental therapy. At one point, he technically was dead, and had an out-of-body experience. "The doctors told my parents there was a good chance I'd lose an arm and both legs if I even lived," he recalls. "I not only lived and kept my arms and legs, I also had my trigger finger." The lingering physical pain, more surgeries and another year of therapy was one thing. What bothered him even more was missing out on a tradition while he laid in a hospital bed: hunting doves on opening day with his grandfather. "I promised myself I wouldn't miss another dove opener and I haven't since," said Russell. Here Ramsey Russell travels across country to raise money for a burn center. The near-death experience and the mental scars had a profound effect on him, but for the most part, his life eventually returned to normal. He pursued his dream of becoming a deer biologist at Mississippi State University, taking time off during his sophomore year to work on a 107,000-acre south Texas ranch. His job was to shoot does as part of the ranch's deer management plan. "We shot the hell out of deer. Those were our marching ordersâ€”kill every doe and hog you see. It was me and three other college kids living in an old Mexican shotgun shack near the border. We had a great time and we made $500 a month, too. What more could a college kid want?" he says. Shooting deer and hogs and planting food plots made for great memories, but what had the most profound effect on Russell was the sheer number of birds. The region was having wet years and quail and dove populations were booming. Stock tanks were brimming and every north wind brought in a new wave of ducks. With the blessing of the ranch owners, Ramsey burned through cases of shotgun shells, and renewed his love of wing shooting. "I was ate up with deer. That's all I cared about at the time, but shooting all those does became work," he says. "As soon as we were done shooting deer for the day, we grabbed our shotguns and went bird hunting." He went on to finish his degree and started working for the federal government, first in the national wildlife refuge system, then as a habitat and forestry consultant for the Natural Resources Conservation Service. It was, he recalls, some of the most rewarding and fulfilling work he could imagine. Ramsey Russell pursued the career as a deer biologist at Mississippi State University. Here he poses with a trophy buck taken during his college days. "I got to meet with landowners and work up conservation plans and then help them put those plans into action. I was helping them make better wildlife habitat, so I really enjoyed what I was doing," he says. Somewhere during that time, Russell booked a duck hunt with an Alberta outfitter, his first big out-of-country hunt. It was, from start to finish, "an unmitigated disaster." Every clich turned into reality: drunk, lazy guides, crappy food, and shabby lodging. That trip, however, was a pivotal moment. It provided a valuable lesson in how not to book an outfitter. He dug deep into the background of another waterfowl guide, booking the hunt only after Ramsey decided it was worthy of his hard-earned money. He liked the outfitter and the hunting so much, he returned for the next several years, bringing friends. The outfitter liked Russell and his boisterous, upbeat personality so much, he asked him to be his booking agent. "I had no idea what a booking agent was or what he did, but I liked the idea," he said. "Not long after, another guy asked me to do the same thing for an Argentina outfitter. I started doing more research and adding more wing-shooting outfits and developing relationships. I built a website and continued doing some habitat consulting on the side, because I really loved doing that." As his hobby grew into a business and consumed more of his time, he and wife, Anita, his college sweetheart, sat down and discussed their future. The government job had advantages. A steady paycheck, pension and benefits made abandoning public service tough. Besides, he had three young kids to support. But Russell hated the bureaucracy. The idea of making his own way with his wife by his side was too alluring. And so, he decided, it was time to launch a business named after his personal creed: "Life's short, get ducks" and getducks.com was born. Ramsey Russell with his three children and gun dog. It was, he says, like jumping off a cliff in the dark. He and Anita took the plunge, but instead of falling, they went straight up. 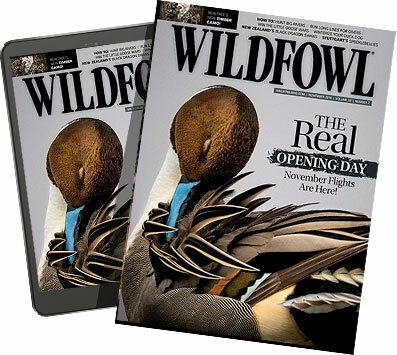 His business steadily grew into one of the most reputable waterfowl booking agencies in the world as more outfitters sought him out and asked Ramsey to send hunters their way. The best part? Russell considers it mandatory that he visit and hunt with an outfitter before adding them to the list of recommended camps. "I take it personally. If I'm going to send a client on a hunt half way across the world or even in the next state, I need to make sure I'm sending them to a great destination. I've stood knee-deep in the water, eaten the food, done all the paper work and gone through the airports. I know what my clients can expect because I've done it," he says. There's no telling how many outfitters Ramsey's hunted with since he started his business. For every one that passed Russell's strict standards and are now part of his network, there are three, five, maybe even a dozen that weren't quite good enough. Contrary to what you might think, though, he doesn't reject an outfitter because the food doesn't meet some culinary benchmark or the staff doesn't turn down the beds while the hunters sit in a blind. What matters more than anything is an abundance of birds. He wants his clients to have the adventure of a lifetime, even if they've already hunted some of the best places in the world, or it's their first trip to Arkansas' famed rice fields. Even though he doesn't collect species like many of his clients, his travels account for nearly 90 waterfowl subspecies total. Ramsey Russell with friends and family with a bunch of birds after a great day of hunting . The places he's already been aren't enough, though. A friend once called him the Christopher Columbus of duck hunting. Always searching for uncharted territory and the next big thing in waterfowling, Ramsey constantly scours the map, flipping rocks to find new opportunities. He often finds spots most never dreamed of as duck destinations. Right now, he is booking hunts in Pakistan for next year. "That's my personal Holy Grail hunt. From what I've seen, it's a phenomenal opportunity in one of the most unique places on earth," he says. He's also investigating locations like Eastern Europe, the British Isles, Iceland and maybe even Mongolia. But before he sends the first client there, it has to pass the Ramsey Russell field test.